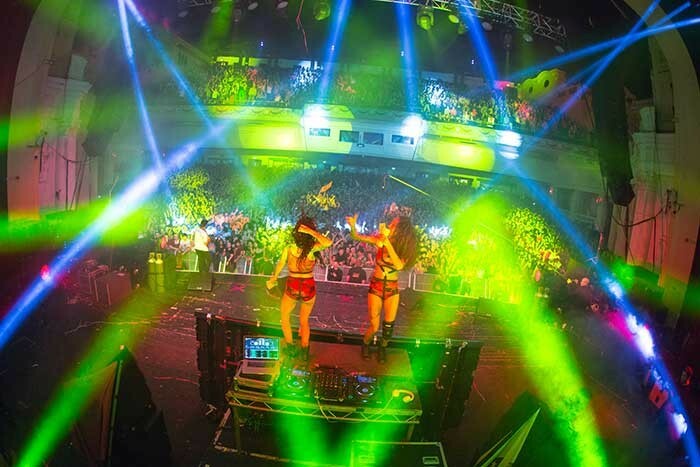 West London based rental specialist Colour Sound Experiment supplied lighting, LED screen, media servers and LED draping for the recent Major Lazer UK and European tour, working with New York based lighting and visual designer Kyle Kegan from Voyage Productions. The creative starting point for the lighting and visual design was the idea of a clean and simple style that could offer those big, beautiful iconic looks and yet dissolve quickly into a ravey beam-fest in true classic dance hall style but with a contemporary twist. The results were a cacophony of Jamaican ‘Rasta colours’ – red, green and gold – setting the colour palette for the entire show, which is also run more like a band set than a DJ performance. Kegan likes to hold the bold, charismatic looks static for the slower elements, gradually building the show over the course of the set, then braking out into “insane symmetrical chases and movements” to provide the requisite energy and snap as the music demands. The sold out London show at Brixton Academy featured their full lighting rig and was based on four key lighting elements. The first was the MC and dancer keylight for which he likes plenty of side light for keying in specials and holding downstage and rear lighting scenes when needed. He used four Robe LEDWash 1200s in the shin-buster positions and eight LEDWash 600s on two sets of ladders stage right and left which framed the stage, together with eight LEDWash 300s mid and upstage providing the “perfect” side and back illumination. Another eight LEDWash 1200s downstage provided washes and keys for this area, and he comments that Robe’s LEDWash series “proved itself once again”. The second element was producing the large textured looks from the flexibility of having profiles all over the rig, which were a combination of Robe MMX Spots and Clay Paky Alpha Beam 1500 HPEs. The juxtaposing of the different gobos, colours, heights and intensities of the two different spot fixtures really proved a unique and different way of achieving the texturing he sought. 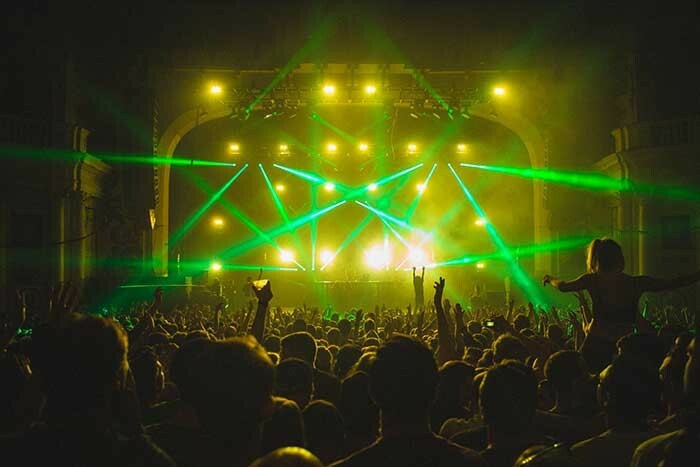 The ‘Lazer’ part of the show came in the form of 20 Clay Paky Sharpys offering the beam plus the prism and gobo for added texture, whilst also being “a big hit when you need it!” He arranged them in groups of four – old-school-new-school ACL style – which is his favourite way to set up Sharpys. The final part of the lighting equation was the “even blast” of conventional blinders and Atomic strobes. The blinders came in the form of 16 x 2-lites and four 4-lites, together with 18 Atomics. The band love the strobes while the blinders are essential for integrating the audience into the high energy Major Lazer action. They also utilised two Jem Roadie foggers for atmospherics – which were ideal for clouding up the environment at a moment’s notice! On this tour Colour Sound also supplied a ColorWeb 250 back curtain right upstage and some of their BT-12 LED panels which clad the DJ booth, replacing its former scenic frontage. Both these video elements for the UK tour were run via Green Hippo Hippo Critter media servers from Colour Sound, and Kegan also has a Resolume Arena 4 control set up to handle any additional video elements that might be encountered at festivals. Color Sound’s crew were Rich Gilson and Toby Lovegrove for the last run of shows, who were “Nothing short of awesome” declares Kegan. Major Lazer continues working with Kegan and Voyage Productions into 2014 and we are promised that some truly innovative new design concepts are planned!